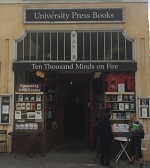 Since 1974, University Press Books has stoked the blaze of far more than 10,000 minds on fire, carrying new scholarship published by the great university presses in the English-speaking world. We also specialize in quality fiction and creative nonfiction. Order from us. Visit us. Let well-wrought words churn and burn within!